JANUARY 10--Rapper Kanye West's mother died of coronary artery disease and various complications from plastic surgery, according to autopsy results released today by the Los Angeles coroner. 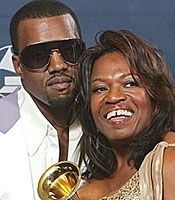 Donda West, 58, died last November following a series of plastic surgeries, including a breast reduction, liposuction, and a tummy tuck, all of which were performed by Dr. Jan Adams. A copy of the West autopsy can be found here.